Scottish-born, Berlin-based musician/author/journalist Momus – real name Nick Currie – offers a delirium of visions, practical and absurd within a body of work that has assured him cult status across the globe. 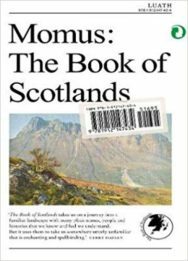 In Book of Scotlands he re-imagines many Scotlands from past, present, future and parallel universes, many of which we might like to visit someday. The Scotland in which four hundred years of profound influence from Calvin is replaced by four hundred years of profound influence from Calvino. The Scotland in which all maps of the country are displayed upside-down and back-to-front to make everything fresh. The Scotland whose capital is known fondly as ‘Auld Greeky’ and the Greece whose capital is ‘the Edinburgh of the South’. Schools, offices, mortgages and cars don’t really exist for the Scots; somehow they’ve diverted the things that preoccupy the rest of us and pared their lives down to bare essentials. They subsist without visible means of support, seeming to live on air, water and febrile nerves. It takes a while to adjust to the nervous energy of the Scots. Their society is constantly bombarded with information – not from above, but rather from below, from the grassroots. Trends come and go in the twinkling of an eye, and everyone has a hand in it. Behind the façades of musty, gritty bohemian terraces, Scottish life is a scintillating string of inventions garlanded with witty bons mots. A middle-aged lady in a shabby café might be wearing limited edition Lucha Libre retro basketball shoes and a Mexican wrestling mask while working on a script for a film she’ll shoot with a cheap digicam. A kid nearby is building a paper helicopter that really flies. Two bearded twins are talking about the links between cacti and calculus. Everyone seems super-bright, slightly neurotic, and joyfully intense. Barter is widely practised, and most people live without bank accounts or, for that matter, incomes. They rarely leave the locality, and yet the whole world seems to come to them through the air, intellectually. When acquaintances meet on Edinburgh’s George Street there’s immediately a flurry of enquiries about ‘projects’. None of these projects are commercial in any way. The Scots are post-money. They live for experience, for collaboration, for networking, for the intense sociability of the art opening, for the pleasures of the moment. They do everything without payment, just for the sake of doing it. Most grow their own food on allotments, some live in geodesic greenhouses. No gallery reception is complete without the ritual exchange of cabbage and cauliflower. Scots seem always to be chewing gum; in fact it’s a natural drug similar to khat, and it keeps them hyper-alert and sharp. They call it ‘chaumy’ and grow it on their allotments to trade on the black market or to pass around their friends. Many Scots smoke chaumy pipes in the dive bars called Chaumy Lairs. You can go to an Edinburgh Chaumy Lair at any hour of the night or day and a skeletal Scot with red, hollow, burning eyes will engage you immediately in debate about life, art and politics, for as long as you like. The storytellers, machars, will make you roar with laughter with one of the shaggy dog stories they call ‘bloont plooms’. A Scottish party is only getting going at 6 or 7am, and won’t wind down until the next day, so take a packed lunch – and breakfast just in case. You might think that this bohemian intensity would slow when couples have children, but not a bit of it: people just take their kids wherever they go, and if the parents stay up three days in a row, the kids do too. My time in Edinburgh passed in a whirlwind of parties under vast paper lanterns. I remember church cellars twinkling with artificial blossoms, beaches dotted with improvising dancers, sheep farmers piping their flocks across urban mountains, reciting epic poetry. Brilliant chatter rings in my ears, turns of phrase I will never forget, glimpses of profoundest wisdom lightly told, sexual encounters followed by food which tasted better than anything I’ve ever eaten. Truly, the precious filament of existence burns more brightly in that happy land. I am convinced that every Scot has grasped the most salient and mysterious fact of being, its glowing ruby kernel: the knowledge that life rewards those who love – but really love – to live. The mist-filled Scotland in which people chant Hugh MacDiarmid poems over Side Two of David Bowie’s Low. The Scotland in which there is no repetition. No two houses are alike, nobody has the same name as anybody else, there are no habits. Every television show is seen just once, and no Web site visited twice. If you’ve used a word before, you have to make up a new one. The Scotland which establishes a new world religion in which Scottishness is next to godliness.